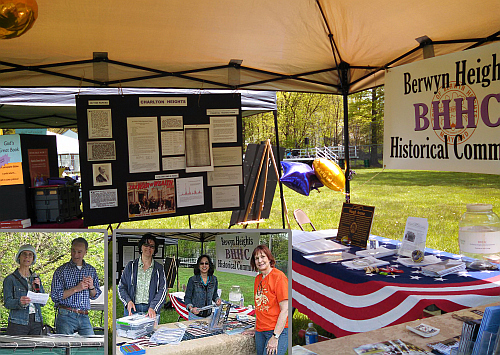 The Historical Committee was proud to feature the historic home of one of its members, Lee Fuerst, in this year’s Berwyn Heights Day and National Night Out exhibit. Lee and her husband Mark purchased their house (PG: 67-022-23 survey) in 2011, and have since turned it into a beautiful show piece of the Victorian “cottages” that originally dotted the subdivision. The house, once poetically named “The Maples,” was built circa 1888-1889 by the Charlton Heights Improvement Company,1 and retains many original architectural features: from shutter dogs to pocket doors to plaster moldings, even a chandelier made for gas lighting. 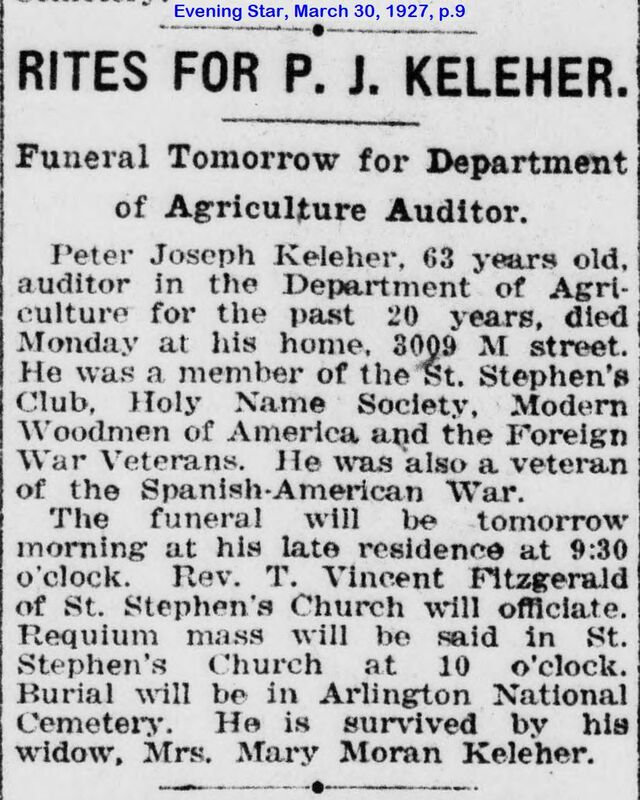 The first occupants of the house were Peter J. Keleher (1864-1927), his sister Hannah and her husband Terrence J. Gorman.2 The Kelehers were a close-knit Irish Catholic family from Wisconsin, who made their way to the Washington, DC area via Albany, NY in the early 1880s. Here, with Peter’s older brother Timothy leading the way, the Keleher brothers in turn worked for the DC Auditor’s Office3, and then the US Treasury Department’s 6th Auditor’s Office4. Sometime during this period, they became acquainted with Edward Graves and James Waugh, the principle developers of the new railroad suburb Charlton Heights (now Berwyn Heights), and helped sell properties in the new subdivision. In recognition of their role, Keleher Avenue (now Ruatan Street) was named after them. After the collapse of the Charlton Heights venture, Peter Keleher was instrumental in turning Edward Graves’ mansion into a summer home for the DC-based St. Ann’s Orphanage. He was the President of St. Joseph’s Union, when the charity purchased the house in June 18975 and raised funds to remodel and expand it to accommodate more of the orphanage’s children.6 One year later in 1898, he joined the 4th “Immunes” Volunteer Infantry Regiment to fight in the Spanish-American War.7 After the war, he returned to work for the Treasury Department and later the Agriculture Department. In January 1904, he married Mary Ann Moran of Georgetown. 8 Throughout his life, Peter was an active member of Catholic congregations and benefit societies. He died in March 1927 and was interred at Arlington National Cemetery9, where his brother Timothy is also buried. From 1935 to 1944, Charles Mayo Attick (1882-1975 ) and his wife Lillian owned the house, which in those days sat on a large property that included most lots in block 42. Additionally, the Atticks owned a number of lots in adjacent blocks 31 and 41.14 Some of the land would eventually be conveyed to the 9 Attick children, most of whom still lived with their parents when they moved to Berwyn Heights.15 The Atticks had previously owned a farm on Edmonston Road near today’s Capital Beltway, which was taken by the Resettlement Administration as eminent domain to serve as a staging ground for building the Greenbelt development.16 Charles Attick owned a barber shop in Berwyn near the streetcar line on the west side of the B&O tracks,17 and served on the Town’s Board of Commissioners from 1938 to 1944, the first 4 years as Chairman. His oldest son, C. Mayo Attick, took over the barber shop, an institution still remembered by some of Berwyn Heights’ older residents. 1 PGC Tax Assessments, 1888-1890. 2 More detailed information about members of the Keleher family can be found in the biographical sketches of the BHHC’s 2006 “Keleher Avenue” pamphlet, authored by former BHHC member Ann Harris Davidson with research assistance by Julia Coldren-Walker. 3 P.J. Keleher replaces T.D. Keleher in District Auditor’s Office. “District Government Affairs: An Appointment,” The Evening Times, 26 January 1884. 4 The 6thAuditor’s Office of the Treasury Department also employed other men who were connected to the Charlton Heights enterprise. It appears to have been a place where Treasury employees were solicited to purchase properties in Charlton Heights. In 1887, Richard M. Johnson was Chief Clerk in that Office, Timothy Keleher Disbursing Clerk, and Patrick Cunningham Chief of Division. 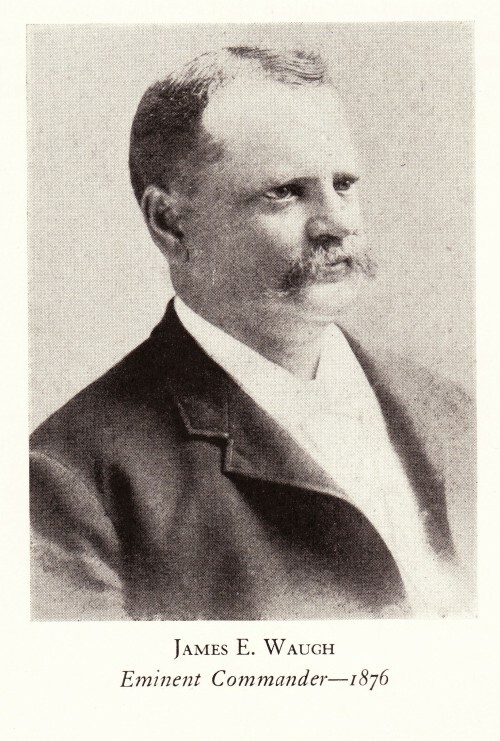 Both Johnson and Cunningham served on the Board of Directors of the Charlton Heights Improvement Company in 1888 and 1889, respectively, while Timothy Keleher served on the Board of the Charlton Heights Investment & Building Association, an entity set up in 1890 to raise funds for the development of Charlton Heights. The 1888 Charlton Heights subdivision plat has corresponding street names: Johnson Avenue (Quebec Place), Cunningham Avenue (Cunningham Drive), and Keleher Avenue (Ruatan Street). T.D. 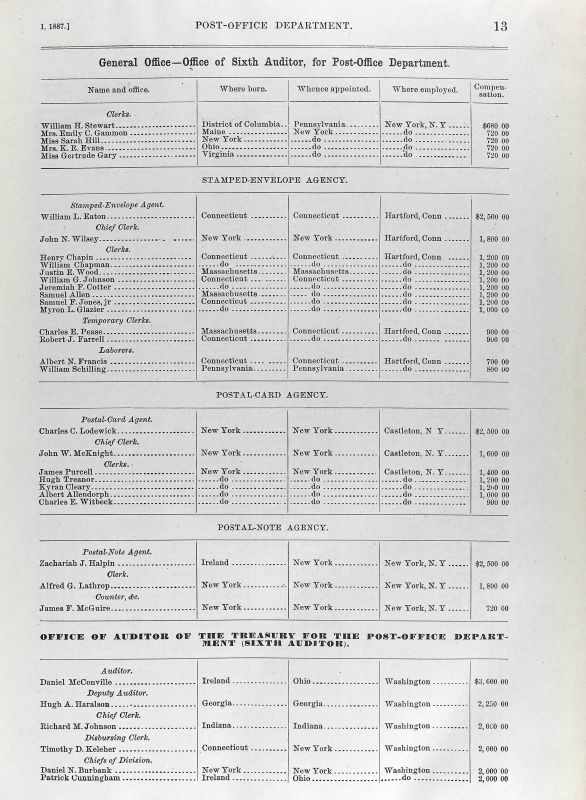 Keleher is listed as disbursing clerk in 6th Auditor’s Office in D.C. City Directory, 1886; and US Register for Civil, Military and Naval Service, 1887, p.13. P.J. Keleher’s appointment to permanent position in 6th Auditor’s Office reported in “Treasury Department Changes,” Evening Star, 23 April 1888, p.1. Incorporators of Charlton Heights Improvement Company listed in “A New Real Estate Company,” Washington Post, 30 August 1888, p.6. Members of Board of Directors of Charlton Heights Improvement Company listed in “Election of Officers,” Evening Star, 26 January 1889, p.3. 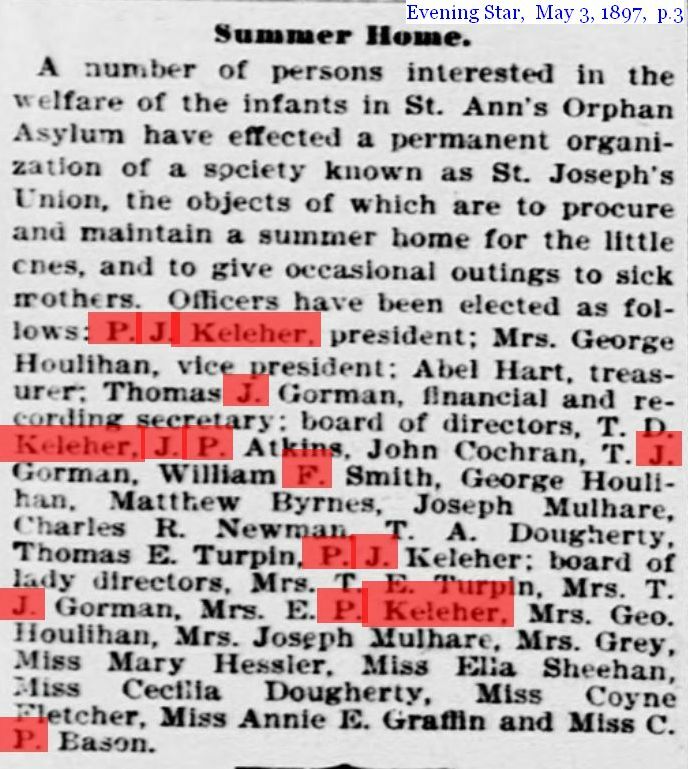 5 “Summer Home,” Evening Star, 3 May 1897, p.3; and “Summer Home for Orphans,” Evening Star, 12 June 1897, p.3; and Deed 12 June 1897, Edward & Katherine Graves to Sisters of Charity, PGC land records, book 39, page 715. 6 “Garden Party & Bazaar,” The Times, 15 August 1897, p.12; and “St. Joseph’s Union,” 12 November 1898, p.8. 7 “Regiments of Immunes,” Evening Star, 14 June 1898, p.3. 8 “Marriages,” Evening Star, 9 January 1904, p.6. 9 “Rites for P.J. Keleher,” Evening Times, 30 March 1927, p.9. 10 Deed 1915 Augusta & Paul Bornsen to Sarah M. Stevens, PGC Land Records, Book 91, Page 488. And Deed 1923 Sarah M. Stevens to Mary L. Biondi, PGC Land Records, Book 194, Page 469. 11 “Pierre Christie Stevens,” http://www.ArlingtonCemetery.net/pcsteven.htm, accessed July 31, 2018. 12 Berwyn Heights Association Meeting Minutes, 2 November 1916, 1 February 1917, 12 April 1917. 14 Deed 29 October 1939, Prudential Building Association to Charles M. & Lillian L. Attick, PGC Land Records, Book 431-382. And Deed 28 June 1944, Charles M. & Lillian L Attick to Henry E. & Florence I. Edmunds, PGC Land Records Book 756-290. 15 1930 and 1940 U.S. Census. 16 Told by Michael Attick, grandson of Charles Mayo Attick. Their eldest son, Peter Louis, left for America in 1881,4 and opened his own tailor shop on 923 E Street, NW in Washington, DC.5 His sister, Maria Augusta, followed her brother in 1885, and was soon joined by two other sisters Johanette and Katrinka. In 1888, Johann and Marie Bonnet gathered up their youngest children Gustav and Emily and also came to America.6 With assistance from Peter Louis and his wife Mary, they purchased a property in the newly platted suburb of Charlton Heights in March 1891, and had a house built on lots 8, 9 and 10 in block 7.7 This classic box-style foursquare, described as a conspicuous landmark in a Prince George’s County historic survey, still stands at 5617 Seminole Street. Bonnet-Gahan House at 4816 Berwyn Rd, Berwyn, ca 1910. Once settled, the Bonnets joined Charlton Heights social circles, hosted card games and musical evenings8 and attended Berwyn Presbyterian Church.9 Johann, now John Bonnet, began investing in real estate, and with his wife purchased a score of tax sale properties in the vicinity.10 Several were located in Lakeland, but most were near their home in block 7. In 1897, John and Marie transferred the house to their son Gustav. In 1903, they purchased a 1½ acre parcel across the tracks in Berwyn where they built a pretty Victorian house,11 today located at 4816 Berwyn Road. That house passed to their daughter Emily and her husband Arthur B. Gahan, a renowned professor of entomology at the University of Maryland.12 Their daughter Winifred Gahan next owned the house and lived there until she died in November 2002. You might ask what happened in the election and whether John Bonnet and his fellow nominees were in fact elected commissioners of Berwyn Heights. The short answer is ‘maybe’. A longer explanation must wait for another post. 1“Berwin Heights Items,” Evening Times, April 28, 1896, p. 4. 2 “The Gray Family – Vignettes,” Robert Gray, 2010. 7 Deed February 3, 1891, Charlton Heights Improvement Co. to Mary Bonnet, PGC Land Records JWB 25-515. 8 “Berwyn News,” Evening Star, February 10, 1892, p.3. 9 “The Social World-Berwyn,” Evening Star, November 27, 1897, p.7. 11 Deed April 22, 1903, Edward Daniels to John C. Bonnet, 1½ acres of former Reyburn tract, Book 11 Page 408. 12 “Gahan Family Papers,” University of Maryland Archives, Special Collections, 1905-2003. The Charlton Heights Improvement Company, the instrument for developing and marketing the subdivision of Charlton Heights between 1888 and 1892, had its main office at 933 F Street, near its intended clientele. At the time, F Street was a center of commerce in downtown Washington, not far from the Patent Office, the Census Office and the Pension Building, whose employees would have shopped and dined in the stores that lined the street. Also on this block was the old Masonic temple (still standing), a popular venue for meetings and celebrations of the numerous fraternal organizations then in existence. Several of the directors of the Charlton Heights Improvement Company, James Waugh, George Gibson, Chas Duncanson and John Miller, were prominent masons and likely frequented the temple to participate in masonic functions. 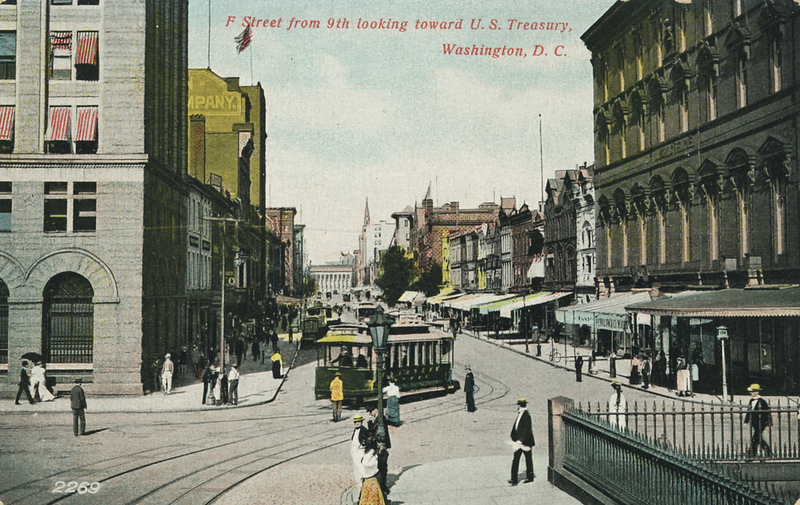 As it happens, native Washingtonian and local history enthusiast John De Ferrari features an F Street Stroll in his Streets of Washington blog It gives a detailed description of this section of the city at the turn of the 19th century and is well worth a look. The day began with a glitch that had BHHC members scrounging for a canopy under which to set up the exhibits. A slightly damaged one was located in the Town office, which served just fine for the remainder of this bright, sunshiny day. Many visitors stopped by to chat, peruse the exhibits and pick up brochures. This year the BHHC re-issued the Waugh Avenue (Berwyn Road) historic marker. The original one was dedicated in 2004 as the Committee’s first historic marker. Since then, we have learned much more about Waugh and the Charlton Heights venture, which makes up the first chapter in our Town’s history. The new marker corrects previous errors and puts Waugh’s role into context. Waugh largely escaped the legal consequences through stalling maneuvers and withholding of documents. But he had gone deeply into debt to buy back a large number of lots from the Charlton Heights Improvement Company upon its dissolution.³ Many of these lots became the property of Jacob Tome, a wealthy Maryland Banker who had financed Waugh’s real estate dealings. Waugh died suddenly of a heart attack in May 1895. Much of his estate was distributed to creditors. In 1896, residents made a fresh start and had the subdivision incorporated as the Town of Berwyn Heights. ¹ “Charlton Heights Improvement Company Articles of Incorporation“, Library of Virginia. ² “Equity Case Files re: lawsuits against Charlton Heights Improvement Company, Charlton Heights Investment & Building Association,” Record Group 21, Entry 69, U.S. National Archives & Records Administration. ³ “Prince George’s County Land Records: JWB Book 22, Pages 44, 53,” Maryland State Archives.